Because American grocery stories sell imported fruits and vegetables from all over the world, enjoying seasonal produce has lost some of its excitement. 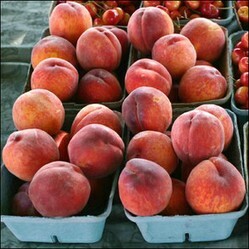 But peaches are one fruit that is very hard to find except in the summer. I actually am thankful for that scarcity since it makes peaches so much more precious to me. When you find a source for locally grown peaches, stock up! Don't be afraid to buy a half bushel or a whole bushel. The price is signifigantly lower than what you pay at the supermarket, and you will have plenty to share with friends and family. A gift of fresh fruit is thoughtful of your friend's health and well being. He will love you for it.﻿ So share your peaches generously. Then use these ideas for enjoying the rest of your bushel of peaches. 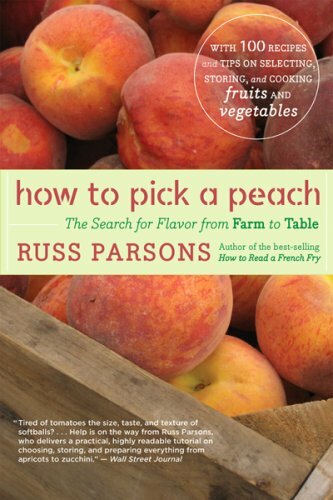 Peaches ripen quickly when left at room temperature, so you have a window of probably two to three days to eat fresh peaches from your bushel or half bushel. Make the most of those few days by highlighting peaches in every meal. Preparing peaches is easy. Simply wash, peel, and slice. Add a squeeze of citrus juice such as orange, lemon, or lime. If desired, sprinkle with sugar to add sweetness and macerate the fruit. The peaches will release juices that mix with the sugar to form a delicious syrup that is 100% natural. The standard peach desserts are such a treat when made from scratch with fresh peaches. As a bonus, peach pies freeze well. Make a couple of pies or a batch of individual fried peach pies to store in the freezer for later. If you have a favorite recipe for apple pie, simply substitute peaches for the apples. Just be sure to omit the spices. Cinnamon and nutmeg are not as complementary to peaches as they are to apples. Peaches pair perfectly with pork. In fact, any recipe that you have for pork and apples will probably work with peaches instead. Your peaches will probably not need quite as long to cook, though, so take the time difference into account. If you have some rosemary growing in your herb garden, try this delicious Pork Chops with Rosemary Peaches. Or fire up the grill and make Raspberry Chicken Salad with Grilled Peaches. How about Pork Tenderloin with Peach Salsa from Annie's Eats? That looks amazing! This dish uses boneless, skinless chicken breasts and is cooked in the oven. Frozen peaches could be substituted for the fresh in this recipe. Fire up the grill for this easy dish featuring fresh peaches. We all should be getting more fish into our diets. This is a good recipe for people who don't otherwise enjoy fish. After making some savory peach entrees, a fabulous peach dessert, and eating many fresh peaches, you've probably got a lot of peaches left in your bushel. The best course is to prepare them for storage so that none are wasted. Peaches ripen very quickly. Leave them on your kitchen counter for just two days and you will be needing to deal with them before they begin to rot. I prefer to freeze peaches because canning is a bit cumbersome to me and requires more equipment. Juice two to three lemons and put the juice (and pulp, if desired) into a large bowl. Alternatively you can use orange juice. If you want a sweeter taste, toss up to a cup of sugar onto the peach slices. This will macerate the fruit and create a delicious fruity syrup. Put the peaches into freezer bags or plastic containers. Label and freeze. Frozen peaches can be thawed and eaten as topping for ice cream or cake. They can also be used in cooked main courses, such as with chicken or pork. Add them directly to the blender for making delicious peach smoothies that taste like summer any time of the year. How do You Prefer to Preserve Peaches? Preserve? There are none left to preserve! my favorite is yours, Jimmie :) fried peach pies is anything more delectable? do you use lard or crisco? type up your recipe will you please? Peaches can help with anemia, high blood pressure, constipation, and dry cough. My favorite is peach cobbler with vanilla ice cream. There's no fruit I like better than a perfectly ripe, juicy peach, so much better if they're from the local farmers market than the grocery store. Peach cobbler is my recipe of choice -- and it's easy -- when I want to make use of extra peaches before they get over-ripe or go bad. This page is making me think about the three peaches ripening on my kitchen counter. Not quite there yet! 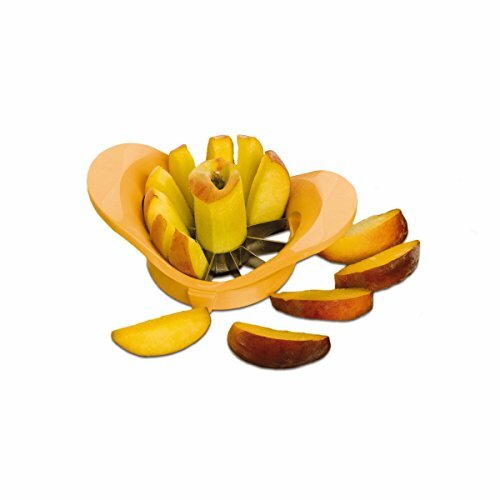 Would my apple corer work for a peach??? You've got me wondering. I bought fresh peaches from an orchard two years ago and they wouldn't let us pick since the peaches are so delicate, but they were so yummy. Beautiful page to drool over. Peach pie is my specialty. Makes my mouth water just looking at them. I love peaches. Wrong season for us. This page really has me craving summer stone fruit. Nicely done. (we already used up all that we froze). I really love peaches too. I make a nice peach chutney and serve it over pork or even salmon. It is so good. But peach cobbler is a perfect dessert and really pleases Jim. I had a nice bowl of freshly sliced peaches with some vanilla frozen yogurt on top last night. Yum! I have some more that I going to put either in a pie or try some baked empanadas. They are such a treat. I'll keep these recipes in mind for the next batch I get. Those were the days, when I canned my own. It is an undertaking, but so good in the dead of winter. I made sure not to over cook them, and used an ultralight syrup. But frozen are so convenient. Thanks for all these great ideas! Oh yum! It's been so long since I had a peach - and unfortunately we'll have to wait a little longer in the southern hemisphere. I love the meal plans and the reminder that fruit works so well in salads and savoury dishes.